COUNTRY BUILDERS BANK AND FIRST MACRO BANK ANNOUNCE MERGER | Country Builders Bank Inc. Combined banks will drive wider scope of reach in Metro Manila and nearby communities. 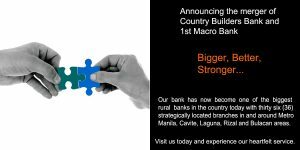 Country Builders Bank (CBB) as the surviving entity will become the biggest rural bank in Metro Manila in terms of branches. Villa Milagros, Montalban Rizal – February 19, 2017 – Country Builders Bank, Inc. and First Macro Bank, Inc. have officially announced to its officers and staff the merger of the two (2) rural banks. The event was held at the ancestral mansion of the Liamzon family in Montalban, Rizal with a theme “As One, We Are Stronger”. Over the past decades, CBB and FMB have delivered financial assistance and various savings programs to thousands of individuals and entrepreneurs in Metro Manila, Cavite, Laguna, Rizal and Bulacan areas.